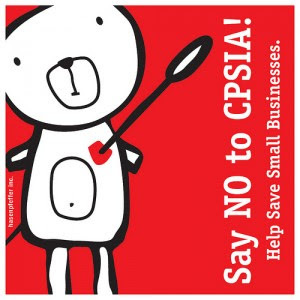 CPSIA: One little law that will drastically change life as we know it. As of February 10th, every single item manufactured for children ages 12 and under — everything E-VER-Y-THING that a child MIGHT use — will be required to undergo costly testing for lead and pthalates, or be destroyed. It will be illegal to sell these items, and therefore they must be discarded, thrown away, into our landfills. Everybody who sells these items, large companies, small companies, home business, second hand stores, that cannot afford to meet these new requirements will be forced to stop selling children’s products or go out of business. These people, now without a job, will be forced to find a new way to provide for their families, in an already difficult job market. Our fragile economy, will be dealt a serious blow (and let’s face it - can it really handle this kind of blow without crossing the line into full-blown Depression??) because of one well-intentioned, but poorly executed law. It gets worse. Those who CAN afford to comply with the law, will have to raise the prices on their products. Drastically. Because the cost of each and every one of their component materials will increase drastically since the tests required are highly expensive and required for each component even if already tested for another product (some people suggest there are other efficient methods of testing that are significantly less expensive.) The big companies will still be able to make and sell their products, at a higher price, but who will be able to buy them? Many people will be out of jobs, and many others - effected by a tight economy worsened by a sudden influx of bankruptcies - will not have room in their budgets. Since clothing, shoes, ponytail holders, toothbrushes, and backpacks will now cost so much more, people will have to curb their spending on toys, board games, books, craft supplies and other accessories. And what about children’s furniture? Already expensive, the prices are sure to skyrocket. Don’t believe me? See THIS. Or any of THESE. Even organic items, items whose testing process is much more strict than the requirements of this law, will have to undergo these specific tests. Organic items are already more expensive and like everything else, they will either fall by the wayside or undergo a price hike. Bye bye lovely organic fill-in-the-blanks. And can you IMAGINE baby items? Diapers, bottles, wipes, rattles, toys, teethers - You’d sure better hope they can get some replacement diapers back on the shelves - PRONTO! Imagine also what this does for schools. As of February 10th, everything in their classrooms will not be tested and approved materials. I don’t think they’ll be required to throw that all away, but when they look to replace those things - crayons, books, scissors, glue, paper, tissue, tape, desks, chairs, math manipulatives, you name it - they’ll have to look for approved ones - and they’ll have to pay the higher price, too. Similarly, libraries will have to pull all the books from their children’s section, as they’ll no longer be allowed to loan them out to children. On top of that - second hand stores, yard sales, etsy, ebay, craigs list - say goodbye to finding children’s items here. You won’t be able to run out and buy used items to avoid paying the higher prices because nobody will be selling them. Small businesses can’t afford the tests, individuals CERTAINLY can’t. And I’m not sure whether or not we’ll be able to give stuff away with places like Freecycle or not. The law is very broad and very vague. And the penalties so steep that people will not want to risk it. I’m not even sure how long it will take for the fortunate companies to put out new products. How long will we have to wait for new books, clothes, shoes, toys, games, hair accessories, toiletries and all the many things affected by this law? The worst part is that the children will be the ones who suffer the most, and this law was created to protect them. Don’t get me wrong - safer products is a GREAT idea. But as I said in the beginning, the execution of this idea STINKS. This law is TOO broad and TOO vague and combined with the fact that it will placed into immediate effect (rather than, say, a transition period) the end results are sure to be disastrous. So what can we do? There is little much that CAN be done. But we CAN do, we MUST do, and we must do it NOW. This law has already been passed. It will take effect on February 10th. There is a committee that has been put together to further define and regulate this law, but they have not had enough time to fully address all the issues at hand. There is really only one person who can choose to delay this law and allow more time for improvement of the CPSIA law before it goes into effect. That person is Representative Waxman, and you can read more about why you NEED to contact Waxman over at The Common Room. You can and should contact your representatives as well, asking them to Contact Waxman as well and encourage him to delay this law for further review. And by contact, I mean phone calls. At this point, we’ve written all the letters we can write, we need to CALL them. Maybe I am exaggerating. Maybe when it goes into effect, it will have been improved and made better and things won’t get this bad. And then again, maybe I’m right. Maybe they’ll rush this through without making the necessary changes. How will our country fare if that happens? What will happen to our economy then? How will we adapt and cope with the giant void created by mass product abandonment? How will our landfills accept the hoards of items now deemed toxic across the board with one wave of a hand? The world I envision is a dark and troubled place. And my friends, I pray that I’m letting my imagination run away with me. I really do. I’m not saying this is the end of the world. I’m just saying, this will completely change life as we know it. Please, spread the word. Don’t think this won’t effect you just because you don’t have young kids. Call your representatives. Call Mr. Waxman. Call the commitee. Call the President! Call anybody you can call. In the early stages, Mr. Waxman was quoted as saying he didn’t think there’d be much response to this if they held a hearing. So. He. Thinks. CALL.